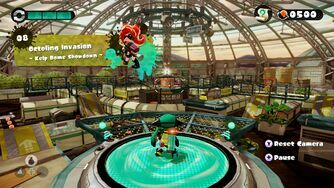 Octoling Invasion is the eighth mission in Splatoon's single-player mode, Octo Valley and the first mission with Octolings, the Octarian equivalent of Inklings. It takes place in a modified version of multiplayer stage Kelp Dome. When Advancing to Area 2, Mission 8 is located on the highest tower on the Western north corner of the area. Following the Power egg path. Hop straight down from the spawn point and the grate, then an Octoling will jump from the centre. Taking it out will make it easier to reach the next checkpoint. Follow the line of power eggs and you have reached checkpoint 1. Follow the line of power eggs to the centre, and another Octoling will come. Again, splatting it will make reaching the checkpoint so much more easier. You will be confronted by another Octoling. Do the same as before. Follow the trail of power eggs round and you will reach checkpoint 2. Follow the power eggs round to find another Octoling, and splat it. There is another path of power eggs, follow it and you have reached the final checkpoint. There is a trail of power eggs, follow them round, and an Octoling will try to ambush you from behind a potted plant. Then, climb the inkrail up to the part you can't usually reach and you will find another Octoling. Splat it, then climb the inkrail to the grate and you have reached the zapfish. Location: Hidden under a ramp, along the western side of the level. Go through the level as you normally would and reach the Zapfish. In its corner facing the rest of the level, head to the closest ramp on the path to the right. Go around the back of it to find the scroll. Location: The armor is on the centre platform. Location: After the second checkpoint, on the grating. The opening cutscene of Octoling Invasion, showing an Octoling on the central platform. The Italian name for the stage contains a pun on serrato (thight, fierce) and serra (dome). 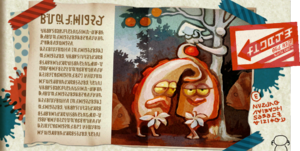 Because of their similarity to Inklings, if an Octoling touches the Zapfish after the shield has been destroyed, the level is completed as if the player has touched it. However, due to the logistics of this, it can only be performed during this level, by prematurely destroying the shield with an Inkzooka.